Please phone the Parish Office on 5596 2632 on Tuesday or Thursday between 9am and 4pm to make a booking. 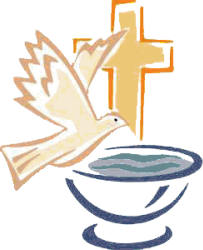 For more general information about Baptism in the Catholic Church please refer to the Archdiocese of Brisbane website. Should you require further information about the sacraments of Reconciliation, Confirmation and First Eucharist for children, please contact the Parish Office on 07 5596 2632. Weddings are usually arranged for Saturday afternoons before 3pm. Please contact the Parish Office on 07 5596 2632 to make arrangements. The Rite of Christian Initiation of Adults is a journey during which persons, who are unbaptised (Catechumens), or who have been baptised in another mainstream Christian Church (Candidates), come to embrace the Catholic Faith, and are initiated into the Catholic Church community. For information about the RCIA Program at St Brigid's, please contact the Parish Office on 07 5596 2632. Please phone the Parish Office on 07 5596 2632 to make arrangements.